With its strong dependence on gas-turbine engines for propulsion, the U.S. Navy is always looking for ways to improve the fuel consumption of these engines. 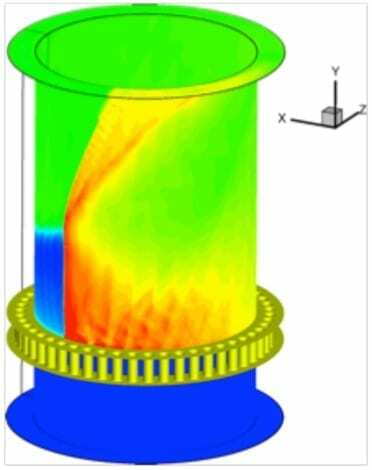 At the Naval Research Laboratory (NRL), scientists are studying the complex physics of Rotating Detonation Engines (RDEs) which offer the potential for high dollar savings by way of reduced fuel consumption in gas-turbine engines, explains Dr. Kazhikathra Kailasanath, who heads NRL’s Laboratories for Computational Physics and Fluid Dynamics. Many Navy aircraft use gas-turbine engines for propulsion, with the Navy’s gas-turbine engines being fundamentally similar to engines used in commercial airplanes. The Navy also depends on gas-turbine engines to provide propulsion and electricity for many of its ships. Even as future ships move toward the model of an “all electric” propulsion system, they will still need gas-turbine engines to produce electricity for the propulsion system and other critical systems. So building a gas-turbine engine that can handle the Navy’s requirements for its warfighting ships and provide a fuel-efficient engine is a high priority for researchers. The U.S. Navy finds gas-turbine engines attractive because they scale nicely to large powers, are relatively small and self-contained, and are relatively easy to maintain. The gas-turbine engines the Navy uses today are based on the Brayton thermodynamic cycle, where air is compressed and mixed with fuel, combusted at a constant pressure, and expanded to do work for either generating electricity or for propulsion. To significantly improve the performance of gas-turbine engines, researchers need to look beyond the Brayton cycle to explore alternative and possibly more innovative cycles. NRL researchers believe that one attractive possibility is to use the detonation cycle instead of the Brayton cycle for powering a gas-turbine. NRL has been on the forefront of this research for the last decade and has been a major player in developing Pulse Detonation Engines (PDEs). The Rotating Detonation Engine (RDE) is an even more attractive and different strategy for using the detonation cycle to obtain better fuel efficiency. NRL researchers have constructed a model for simulating RDEs using earlier work done on general detonations, as a foundation.